The AFC Divisional playoff game in Orchard Park, NY on January 12, 1991 featured two AFC East rivals, the Buffalo Bills, who had topped the division in 1990 with the conference’s best record at 13-3, against the Miami Dolphins, the second-place team that compiled a 12-4 tally to qualify for the postseason as a Wild Card entry. The Bills were in the postseason for the third straight year under Head Coach Marv Levy. They featured a quick-striking offense led by QB Jim Kelly (pictured above), who had fine targets in WRs Andre Reed and James Lofton, plus an excellent all-purpose back in RB Thurman Thomas. The defensive line was anchored by DE Bruce Smith and the corps of linebackers was solid with Cornelius Bennett, Shane Conlan, and Darryl Talley. If there was a concern, it was that Kelly was returning to action after missing 2 ½ games with a sprained left knee, and he had been listed as questionable in the week leading up to the game. Miami was coached by Don Shula for the 21st season and had put together its best record in five years. The offense still featured the brilliant passing of QB Dan Marino, but had gained an added element in the running of RB Sammie Smith, who came on late in the season. The veteran wide receiver tandem of Mark Duper and Mark Clayton was still in place, although Clayton was showing signs of wear. But the offensive line was revitalized by OT Richmond Webb and G Keith Sims, both rookies. The defense also was improved, although the unit’s best player, LB John Offerdahl, was out for the playoff game against the Bills with an injury. Marino rallied the Dolphins to a Wild Card playoff win the previous week against the Chiefs, thus reaching the Divisional round and a matchup with a team against which they had split the season series. There were 77,067 fans in attendance at Rich Stadium for the Saturday afternoon game. The temperature was in the thirties and there was a light mist that turned to a steady snow, which caused the artificial surface to become slippery as the game progressed. The Bills took the opening kickoff and moved in typically brisk fashion to a score in a five-play drive that covered 76 yards. Jim Kelly threw to Thurman Thomas for 20 yards, Thomas ran for 14 and, two plays later, a pass to Andre Reed covered the last 40 yards for a touchdown. Scott Norwood added the extra point and, with less than two minutes elapsed, the home team held a 7-0 lead. The Dolphins responded by going 40 yards in ten plays in a series that was punctuated by five penalties, three of them on the Bills. Pete Stoyanovich kicked a 49-yard field goal that narrowed the score to 7-3. Once again Buffalo moved swiftly on offense. Kelly threw to Thomas for seven yards and then to James Lofton for 44 yards to the Miami 12. The Bills were able to pick up six more yards on a pass to TE Keith McKeller, and that was it, but they added a 24-yard Norwood field goal that made the score 10-3. 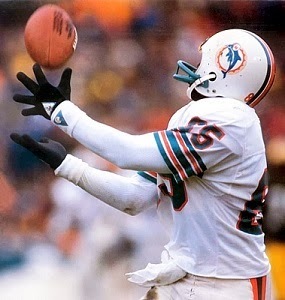 On the next series, a Marino pass was tipped by Darryl Talley and intercepted by CB Nate Odomes. Starting with favorable field position at the Miami 38, the Bills converted a third-and-eight play when Kelly ran out of the pocket for a first down, and although he fumbled, C Kent Hull recovered at the 18. The nine-play, 33-yard possession ended with Norwood kicking another field goal, this time from 22 yards. The score remained 13-3 heading into the second quarter. Following a punt by the Dolphins, the Bills advanced 67 yards in five plays. Thomas (pictured at left) ran twice for eight yards and then caught a pass for another 11 before Kelly threw to Reed for 43 yards to the Miami five. From there, Thomas ran up the middle for a touchdown and, adding Norwood’s extra point, it was a 20-3 lead for the home team. With the game slipping away, it was Miami’s turn to strike quickly. In a third-and-five situation, Marino connected with Mark Duper for 11 yards and then went back to Duper again, this time for a 64-yard TD. Having gone 80 yards in four plays, Stoyanovich added the PAT and Buffalo’s lead was narrowed to 20-10. The Bills responded by driving 68 yards in 11 plays. Kelly immediately threw to Lofton for 19 yards and, two plays later, ran for nine yards. Reaching the Miami 32, Buffalo converted a fourth-and-three play as Kelly connected with Reed for 13 yards. The series ended with a seven-yard Kelly-to-Lofton touchdown pass and, adding the extra point, the home team again enjoyed a 17-point lead of 27-10 with five minutes remaining in the first half. The Dolphins reached midfield before an intentional grounding penalty backed them up and they were forced to punt. However, after returning the kick 17 yards, WR Al Edwards fumbled and the punter, Reggie Roby, recovered at the Buffalo 47. A five-yard carry was followed by two incomplete passes, but then, on fourth-and-five, Marino threw to Duper for 38 yards to the four. Marino ran for a two-yard touchdown with 27 seconds left on the clock and Stoyanovich added the extra point. Buffalo’s lead was 27-17 at halftime. Miami narrowed the lead further with a 62-yard drive in eight plays to start the third quarter. The big play was a 17-yard run by Sammie Smith in a third-and-two situation that got the ball to the Buffalo 12. Stoyanovich finished off the series with a 22-yard field goal that made it a seven-point game at 27-20. The Bills stormed back as Thomas had back-to-back eight yard runs and Kelly threw to Lofton for 31 yards to the Miami 27. However, two plays later Kelly was picked off by SS Jarvis Williams. The Dolphins were deep in their own territory, starting at the two, and on a third-down play from their 12, Marino went long and was intercepted by FS Mark Kelso. With the ball at the Miami 48, the Bills used two carries by Thomas and a pass to McKeller to reach the 33. Facing third-and-seven, Kelly completed a pass to Lofton for 13 yards and, after Thomas gained nine yards on three straight runs, Norwood kicked a 28-yard field goal to make it 30-20. RB Marc Logan returned the ensuing kickoff 30 yards to give the Dolphins good starting field position at their 43, and Marino immediately threw to Mark Clayton for 23 yards. 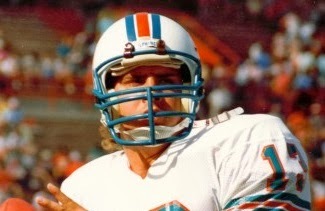 Smith ran twice for 18 yards to finish off the period at the Buffalo 13, and three plays into the fourth quarter, Marino (pictured below) tossed a pass to G Roy Foster, an eligible receiver in short yardage, for a two-yard TD. Stoyanovich added the extra point and Buffalo’s once-formidable lead was down to three points at 30-27. The Bills drove 63 yards in ten plays in response. Kelly completed four passes, including one of five yards to McKeller to convert a fourth-and-two situation, and had a key eight-yard scramble along that way. A 12-yard completion to Edwards advanced the ball to the Miami 17 and a defensive holding penalty on CB Tim McKyer on a third-and-eight play gave the Bills a first down and Thomas ran for a five-yard touchdown to cap the possession. Norwood’s successful conversion put Buffalo in front by ten. The key turnover of the game occurred on the ensuing kickoff when Logan fumbled when hit by LB Hal Garner and Norwood recovered for the Bills at the Miami 29. Two plays later, Kelly connected with Reed for a 26-yard TD. Norwood added the extra point once again and Buffalo’s lead was 44-27 with 9:42 remaining in the game. The Dolphins fought back, with Marino throwing to Clayton for 21 yards and to TE Ferrell Edmunds for eight, and Smith running for 12 yards on a third-and-two play. But the drive stalled at the Buffalo 35 as Marino threw four straight incomplete passes, the last while facing fourth-and-ten. The Bills ran the clock down to under five minutes before punting, and Miami put together a scoring drive of 91 yards in 15 plays. Marino completed eight passes along the way, the last one of eight yards to WR Tony Martin for a touchdown. Stoyanovich added the extra point, but it was a ten-point game with 1:15 left on the clock. When the Bills recovered the ensuing onside kick, Miami’s fate was sealed. The Bills came away winners by a score of 44-34. Buffalo had the edge in total yards (493 to 430) while the teams were even with 24 first downs apiece. The Dolphins turned the ball over three times, the last time with devastating results, to two suffered by the Bills. 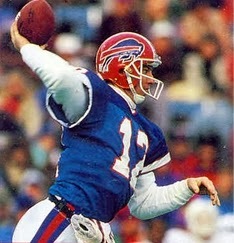 Jim Kelly completed 19 of 29 passes for 339 yards and three touchdowns while giving up one interception. 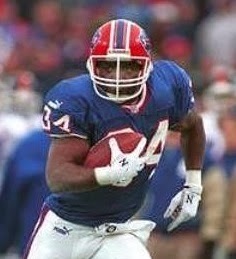 Thurman Thomas ran for 117 yards and two TDs on 32 carries and also caught three passes for 38 yards. James Lofton had 7 catches for 149 yards and a touchdown and Andre Reed had four receptions for 122 yards and two TDs. For the Dolphins, Dan Marino was successful on 23 of 49 throws for 323 yards and three TDs while tossing two interceptions. Mark Duper (pictured below) gained 113 yards on his three catches that included a score while Mark Clayton had four pass receptions for 82 yards. Tony Martin and RB/WR Jim Jensen also had four catches, for 44 and 38 yards, respectively, and one of Martin’s was good for a touchdown. Sammie Smith rushed for 99 yards on 21 attempts. Buffalo went on to rout the Raiders for the AFC Championship but lost a close Super Bowl contest to the New York Giants. The Bills won the AFC title in each of the next three seasons, but fell each time in the Super Bowl. The Dolphins dropped back to 8-8 in 1991, but returned to the postseason in ’92 at 11-5.